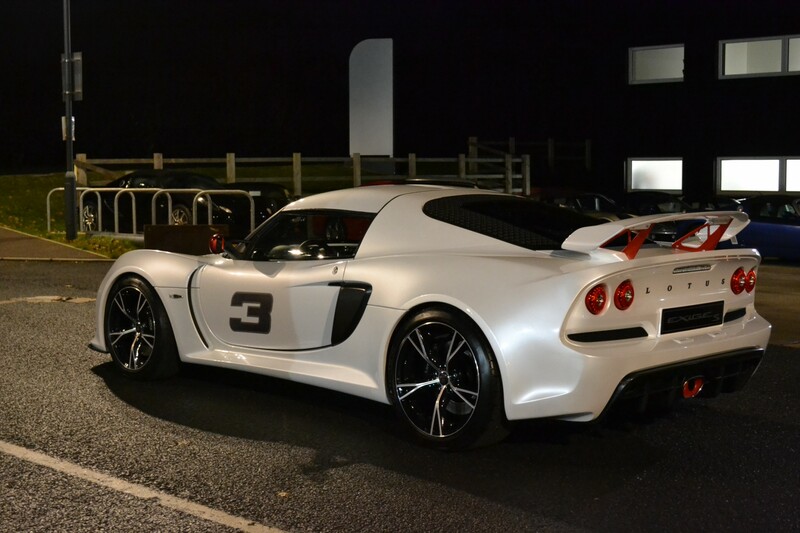 It’s fair to say the new Exige S is one of the most eagerly awaited cars Lotus has produced in quite some time. 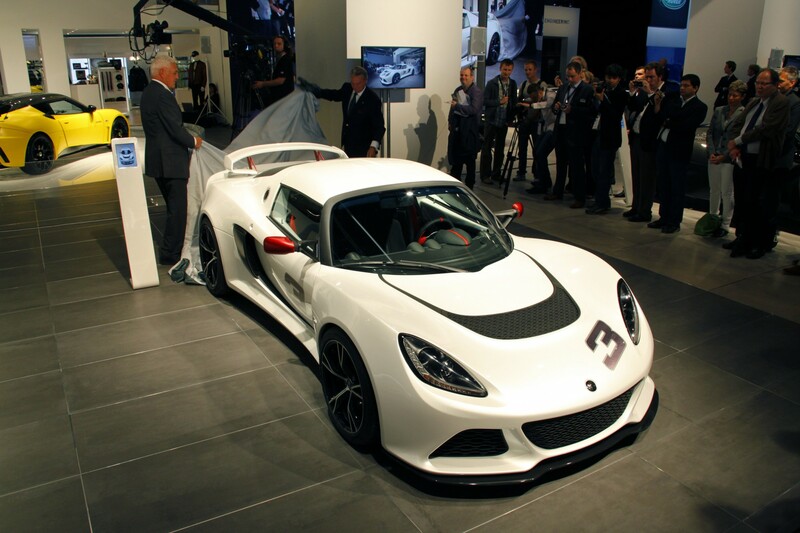 Rumours of a full on, V6 engined, replacement for the S2 Exige have been swirling round for years and by the time of the cars announcement at Frankfurt in September this year there was a real buzz about the car. Over the last week Lotus have been running a selection of Preview Events with various UK dealerships, giving many people their first chance to see the new car up close and talk the their local dealers about the car. Unfortunately the events suffered a set back before they’d even begun, with the Ride and Handling prototype which has been used extensively for testing on the Nurburgring and at Hethel, and which was planned to be driven to each of the dealer events suffered a mishap while test at Hethel the Friday before the first event, leading to the Sunday on Monday showings being cancelled. In it’s place the Frankfurt show car was called back in to action, however being a non-running car it was now to be trailered between events while a MY12 Evora S IPS was brought along as well for those hoping to hear the new exhaust system which is shared between the two cars. While in pictures the new Exige S has divided opinions a little it seems it’s really a car you should take a look at and judge in the fibreglass. In fact I’d go so far as to say pictures don’t do the car justice, a fact which isn’t helped by some odd styling decisions for a car which was going to set to be photographed by the worlds press. The Pearl White paint looks superb in a way which is rarely captured in pictures, but doesn’t photograph well under the harsh indoor lighting of your average car showroom, with the best picture we’ve seen coming from Castle Lotus as they prepared to move the car inside the showroom. There are also numerous little ‘bling’ touches on the exterior which won’t be making it to the production cars such as the red coloured wing mirrors and rear wing supports and the No. 3 decals on the front and sides. With the car in front of you it looks perfectly proportioned, it’s still clearly a small car which can be hustled down country roads and the lines from the door to the rear are nicely resolved and even the Diamond Cut wheels which have seen much criticism start to make sense. The front nicely integrates the MY11 Elise lights and styling cues while still having a clearly more pumped up overall look. While the loss of the roof scoop does rob the Exige of some the aggression of it’s predecessors the layout of the 2GR-FE engine means it would not have given any real benefits. On the plus side the new, heated, glass engine cover gives the dual benefits of allowing a glimpse of the Harrop HTV 1320 supercharger which sits atop the Toyota V6 and affords the car a little more practicality than the previous model, even if the driver will now be peering above and below the rear spoiler as opposed to straight in to the intercooler. The engine cover itself hinges at the roof, as per previous Exiges, but the glass screen gives a similar look to the short lived Europa – however the black plastic mesh which flanks it on each side should aid cooling and avoid the ‘greenhouse’ effect which can cause trouble on tuned Europas. The struts which hold the engine cover open are not gassed powered, so the glass means opening and closing it can require a bit more heft than the S2 Exige, but the struts do lock in place to hold it open to ease loading and unloading. 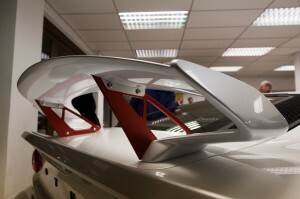 The rear spoiler is the one area which seems to split opinions even with those who’ve seen the car. Unlike the MY10 Exige S spoiler, but like the original S2 Exige design, it lifts with the boot lid meaning no struggling to lift things over it to get them in and out of the boot, but it is perhaps if anything a little fussy in it’s design and looks a little narrow in relation to the rest of the car. All in all though the general consensus seems to be that Lotus have done a good job of evolving the Exiges design. There is no denying that the Exiges interior is still closely linked to that of the other S2 Elise and Exige models, with the basic architecture remaining the same as it has for many years. Compared to the older cars however the feel of the interior, in the show cars Premium Sport spec, is a step up from what has come before it in terms of the seats and items such as the door cards which include a small door pull as a cheeky nod towards the Porsche RS’s the Exige will no doubt be hunting down on tracks around the country. The red interior won’t be to everyones taste, but many photographs making use of a flash have left it looking far brighter than it really is. It does seem like this is simply a show car embelishment as the Product News document makes no mention or these colours for the Premium Sport Pack beyond contract stitching. It’s a real shame that the Ride and Handling car wasn’t in attendance, but a quick run out in the MY12 Evora S IPS confirmed that the new exhaust system which is shared with the Exige S sounds fantastic – and could sound even better in the more enclosed Exige – and at around 400kg lighter the performance should be electric. 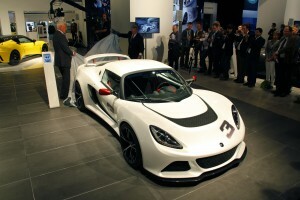 Dealer demo cars are expected to be arriving in February and will give a better idea of what to expect from the finished article, but with the new Exige S, Elise S and revised Evora it’s looking like 2012 could be a golden year for Lotus. 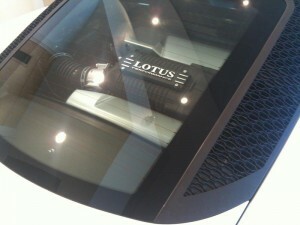 Thanks to all those who supplied photos from the Preview Days and to Group Lotus and the dealerships who took part. You can find our full gallery from the days here.